Aryeh Kupinsky's parents hand out candies to passersby on the first day of Adar, continuing their son's annual tradition. 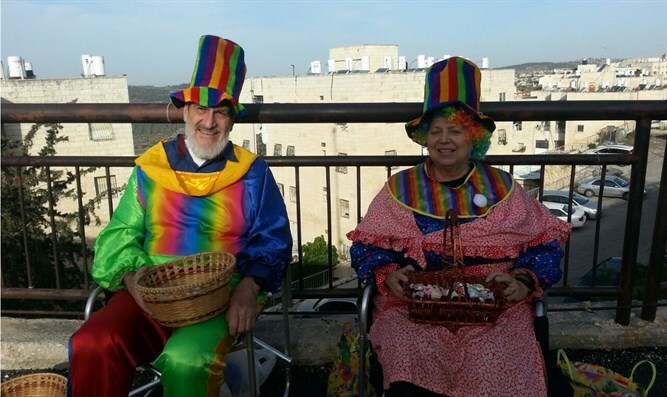 US-born Parents of Rabbi Aryeh Kupinsky, who was murdered by terrorists in November 2014's Har Nof massacre, walked around Jerusalem neighborhoods on Monday morning dressed as clowns, handing out candies to passersby. Aryeh's brother Haim Kupinsky told Arutz Sheva why his senior citizen parents had decided to spend a morning walking around the city on the first day of Adar, a joyous day on which, traditionally, Israeli kindergarten and schoolchildren wear costumes, in preparation for the Purim holiday celebrated two weeks later. "My brother taught road safety to children for a year," Haim said. "Every year, on the first day of the Hebrew month of Adar, he dressed up as a clown with the Road Safety flak jacket over his costume, handing out candies to every child as he or she passed by." "During the week of mourning for my brother, my parents promised to keep this tradition, so every year they get up early and come from Kiryat Arba to Har Nof in Jerusalem to hand out candies, at the same corner where Aryeh did. "It makes both children and adults happy, and it gives a sense of continuity - his children also join the efforts, and we feel like he's still here. Everyone is smiling, and of course cars honk and stop to be part of it all. It's a celebration for everyone, and it's a beautiful way to remember such a special person."